Virginia’s youth need your help: The Virginia House and Senate both propose new youth prisons in their versions of the state budget. We know this is the wrong approach, and RISE for Youth continues to oppose the construction of new, large youth prisons. The communities most touched by the youth justice system have repeatedly asked for a seat at the table to help build a system that truly addresses the needs of our youth and communities. But these proposals in the draft two-year budget don’t reflect our voice. Youth prisons don’t help kids, and they and waste taxpayer dollars. We know that investing in community-based alternatives lead to success for Virginia’s youth and families. 1. Tell VA lawmakers: Let’s invest in a better system! Call the elected officials responsible for finalizing Virginia’s budget. My name is __first and last___, and I live in [City/Town]. 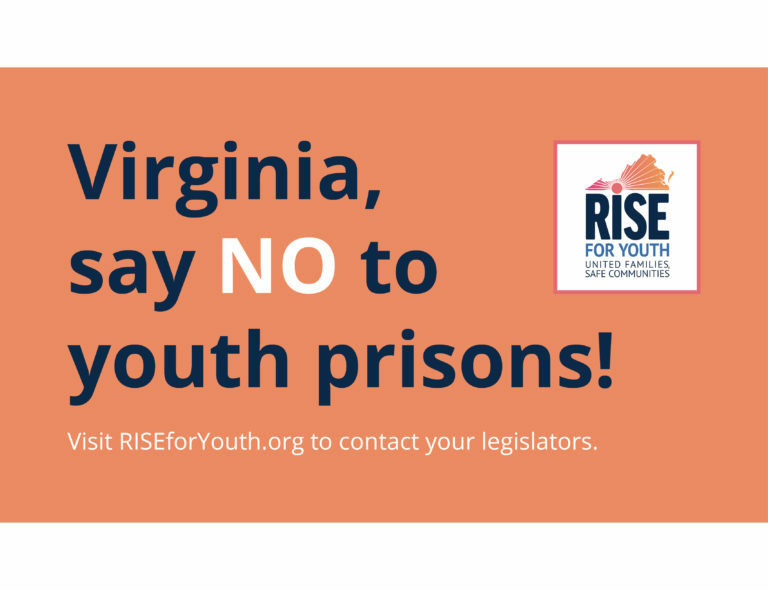 I saw that the legislature is budgeting for new youth prisons and I think that’s the wrong approach for Virginia. Building new youth prisons would threaten to undo the progress we’ve made so far. I’m against youth prisons and so are members of my community. They are an irresponsible waste of taxpayer dollars, especially when we know they don’t work. That’s why the legislature should instead invest in community-based alternatives to incarceration that emphasize smaller, therapeutic options are a better approach. I urge Delegate/Senator __last name__ to keep funds for new youth prisons out of the upcoming budget and make sure that the money from closing Beaumont goes to community programs that will help kids. Forward this email to 10 family members, coworkers, and friends who care about the future of Virginia’s youth. Stay up to date and show your support by following RISE for Youth on Twitter and Facebook.